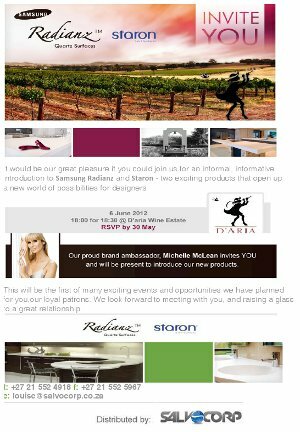 New KSA National member, Salvocorp, are pleased to invite kitchen manufacturers and fabricators to the Cape Town launch of their engineered stone Samsung Radianz, and their solid surfacing material, Staron. The event will be held on the 6th June at the D'Aria Esate in Durbanville at 6.00 for 6.30pm. RSVP to Louise@salvocorp.co.za by 30 May 2012.